Beginning in October, merchants, not card-holders’ banks, could be held liable for costs stemming from credit and debit card point-of-sale fraud. That is, if the merchant has not yet installed EMV-enabled payment terminals that process chip-protected cards instead of those with magnetic strips. It’s not news. The shift has been in the works since 2012 when Visa, Mastercard, Discover, and American Express all announced plans to migrate to chip-embedded cards. 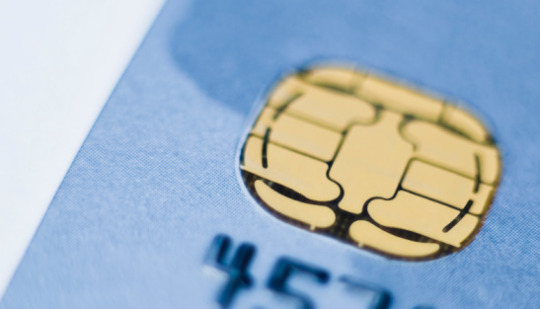 Merchants in Europe, Africa, and elsewhere, began adopting EMV cards a decade ago. Yet many U.S. merchants have no idea that the change is coming. Six months ago, an Ebiquity/American Express survey of 500 businesses with an overall annual charge volume of less than $3 million discovered that 49 percent of U.S. small merchants were not aware of the impending EMV fraud liability shift. The survey also found that 47 percent of merchants have no tools in place to detect and report fraud related to card payments, and 38 percent either do not plan to upgrade their point-of-sale systems to EMV or have not yet decided whether they will, claiming cost of the terminal, software upgrades, and consumer education as the main barriers. But even merchants who are aware of and do plan to adopt the technology might not be ready by October. The Wall Street Journal reported on Monday that the CEO of the Food Marketing Institute, which represents thousands of retail stores and pharmacies, sent a letter to the major credit card companies requesting the deadline be delayed until 2016. “Regardless of how strong the commitment or how many dollars invested, the reality is that the system will not be ready to meet the card networks’ arbitrarily-set mandate for the liability shift in October 2015,” the letter said. For merchants who are simply not in the know, ample opportunities for getting educated exist. American Express is hosting a nationwide Small Merchant EMV Assistance Program to arm small merchants with knowledge about EMV’s security benefits as well as $100 reimbursements for AMEX customers with less than $3 million in annual charge volume who submit requests before April 30. Other resources for merchants seeking more information include the EMV Migration Forum and EMV Connection, the Smart Card Alliance, Visa, Chase Paymentech, and MasterCard.